I’m a writer for all things lifestyle and culture. My stories are dedicated to women, laced with diversity, and are chock full of self-love. You can spot some of my work on The Huffington Post, Complex.com, xoJane, and others. I like good wine, good food, and Beyonce. Check out my hair stories for all your natural hair tips, tricks, and needs! Everyone’s going the more natural route these days. Whether it’s organic groceries, a DIY sugar body scrub, or your fave vegan lipstick, it’s clear that Mother Nature supplies the best stuff for our bodies– and our hair! We already know about all of the yummy natural foods and super moisturizing oils that we can use to help condition our hair, but did you know there are ways to naturally cleanse your mane too?! These natural shampoo alternatives are easy to use and can be combined with your regular conditioning routine. Why not avoid the hassle of finding the right shampoo for your hair type and create your own! Check out our four fave DIY natural hair cleansers below! This homemade shampoo restores moisture to your strands while cleansing the scalp. *Other oils, like avocado, lavender, or almond, work well too! Combine all ingredients in a jar or an old shampoo bottle, shake it all up, and use about a quarter size of the mixture for each use. 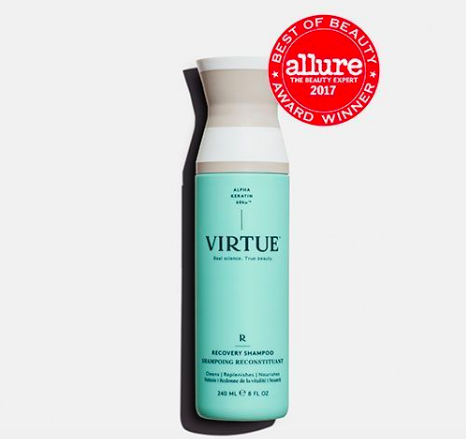 This luxurious shampoo can last for up to a month. This cleanser helps balance your pH and kills bacteria on the scalp. Apple cider vinegar’s anti-fungal properties fight and alleviate dandruff without leaving your strands dry and thirsty. In fact, ACV also seals the hair cuticles for optimum moisture and shine. Combine ingredients into a spray bottle. Separate dry hair into four sections, and spray ACV mixture between each layer of hair from root to tip. Massage the ACV into your scalp and let stand for 3-5 minutes before rinsing. This routine is most effective when applied 1-2 times a week. Tea rinses are gentle on the strands and smell great! But each herbal tea serves its own purpose, so be sure to research which tea will work best for your mane. Rosemary is great for dark hair (and for darkening grays) while chamomile works wonders for lighter colored hair. *When using baking soda, make sure to mix until completely dissolved. Some folks put their tea mixture into a spray bottle while others simply pour the tea directly onto the hair, so apply however is most comfortable for you. When the tea cools to room temperature, massage into the hair and allow your strands to soak up those herbal goodies for 5-20 minutes. Thoroughly rinse, then treat your mane to a moisture-rich conditioner. This may sound crazy, but it is possible to effectively cleanse your hair with just water! By working with your natural hair oils (or sebum), massaging the scalp underwater can surprisingly work wonders. Mane Master Aura Friedman, and many beauty bloggers of all hair types (including yours truly) have reported softer tresses and more manageable hair from just water washing. It makes sense; you aren’t contributing to the scalp build-up, you’re simply washing it all away with the most natural method known to mankind! Fair warning though, washing with hard water can lead to mineral build-up over time, so it may be best to wash with distilled water or to follow-up with a pH balancing cleanser (like an ACV rinse). Let your hair to get really dirty! Seriously, allow your strands to get oily enough that you can distribute all that natural hair oil throughout your mane as you wash. When you’re ready, preen your hair (aka smooth your natural oils down the shaft of your hair) before you wash it. A water wash is best done during a shower. So run a hot shower and allow the steam to soften your hair. Using your fingertips, rigorously massage the scalp to get rid of dead skin cells and loosen the oils in your hair. Wash hair under water. Using a wide-tooth comb (or fingers), detangle your hair from bottom to top. For more ways to naturally pamper your mane, check out pre-poo and co-washing! And, share your fave DIY natural hair cleansers below!